Simon Heys, an incoming freshman from Wilmington planning to major in sport management, accepted words of congratulations from Trustee Rich Sidwell as he reaches the end of the line of well-wishers that included faculty, staff and trustees. Simon also plans to run track and cross country for the Fighting’ Quakers. 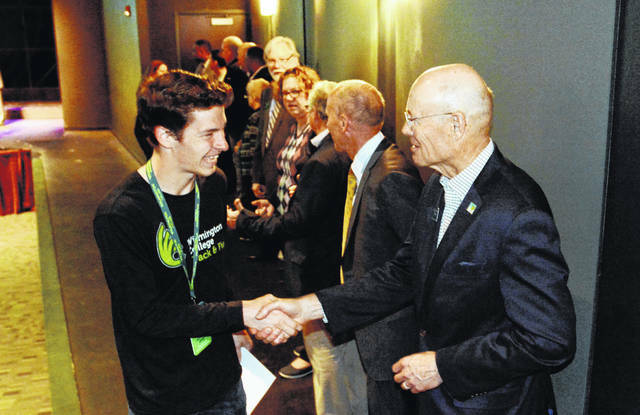 WILMINGTON — Some 400 students and parents packed Wilmington College’s Heiland Theatre Saturday when future students were recognized for the awards and accomplishments that led to their anticipated enrollment at WC. The annual Accepted Student Recognition Day brought 149 students to campus, more than a third of the expected entering class for fall 2019. A number of those in attendance are local and are taking advantage of the Clinton County Succeeds program in which they qualify for up to $10,000 in students loans that are completely forgiven upon their graduation. Adam Lohrey, director of admission, said the event gave the students and their families a chance to visit campus another time, “celebrate” some of the institutional awards for which they’ve qualified and, for some, help them make their final decision to attend WC. “The event provides opportunities for students to get to know some of their fellow classmates in the incoming fall class, as well as to meet and interact with faculty, staff, current students and members of the College’s Board of Trustees, which was on campus for their spring meeting,” he said. Lohrey added that nearly two thirds of the students had already made their commitment to attend WC prior to the event and they were able to “take their next steps” toward enrolling by completing the official registration process. “Also, we welcomed over 50 students to the program who had not yet made their final decision to enroll,” he said. “In prior years, the enrollment yield from this event has been as high as 93 percent. “Our students and their families love the opportunity to celebrate and recognize the accomplishments that have brought them to Wilmington College to pursue their career goals through higher education,” he added, noting that, “with all the moving parts,” this program requires a lot of planning and preparation. The day’s program included a welcome from President Jim Reynolds and Peggy Sturdivant, chair of the Board of Trustees, the scholarship recognition, a personal view of WC called “Quaker Looks,” lunch in the Student Dining Hall, a photo-op with the president and the College’s mascot, Quakerman, and, for first-time visitors, a campus tour. Wilmington College is on-track for another large entering class in fall 2019. The number of new students in the fall 2018 semester was a record-breaker, setting all-time enrollment marks for first-time freshmen with 385 and total new students, which constitutes a combination of the freshmen and 65 transfer students.